‘Site avec 4 personnages’ is part of Dubuffet’s expressive and distinctive series of collage paintings, 'Psycho Sites' from 1981. In each of these works Dubuffet portrayed heavily outlined figures within undetermined space, exploring both the physical and mental environment of the individual. This picture belongs to his most successful works from the series, all sized at 51 x 35cm, which are characterised by their free, painterly quality, naive forms and bright palette which constitute Dubuffet’s late art brut style. Dubuffet initially studied painting at the Académie Julian in Paris. However, disillusioned by its conservatism, he left after only six months. Having rejected conventional practice, Dubuffet was instead drawn to art brut - his term for the art of the insane, children and "primitives". Assimilating these forms into his own work, he developed a highly graphic style with which he dominated the post-war art scene in France, becoming one of the most important and revolutionary artists of his time. Dubuffet particularly admired contemporary and ancient graffiti. The surface of ‘Site avec 4 personnages’, which is built up with thickly applied layers of paint and crudely drawn figures, is reminiscent of a graffiti-covered wall. 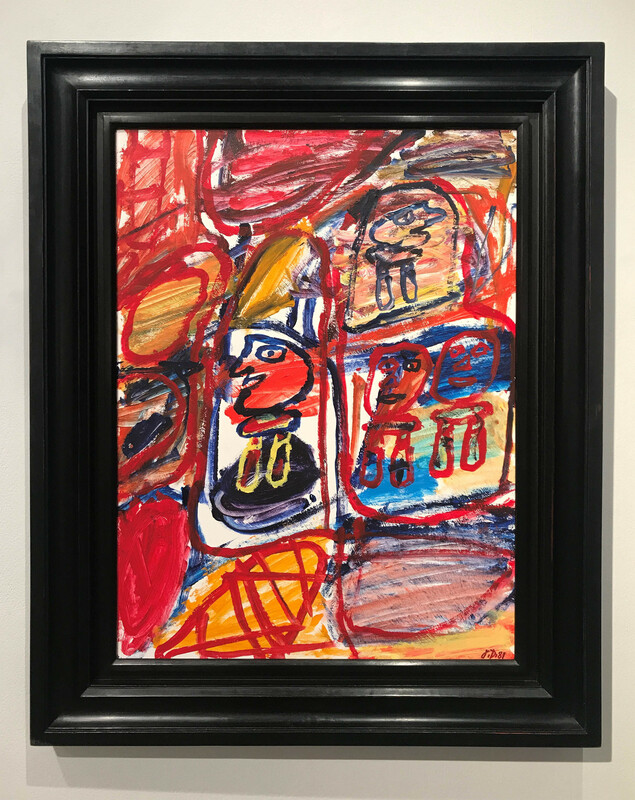 With its all-over quality, vibrant colours and high-energy feel it resonates with the early work of Basquiat who, in 1981, was also struggling with the problems of how to make representational paintings relevant. Dubuffet’s ‘Pyscho Sites’ series also shows the development of his radically new Hourloupe style, which first evolved from a chance doodle whilst he was on the telephone in 1962. Dubuffet believed that this style (a tangle of lines filled with unmixed colour) evoked the way images appear in the mind, recalling his earlier Surrealist tendencies. 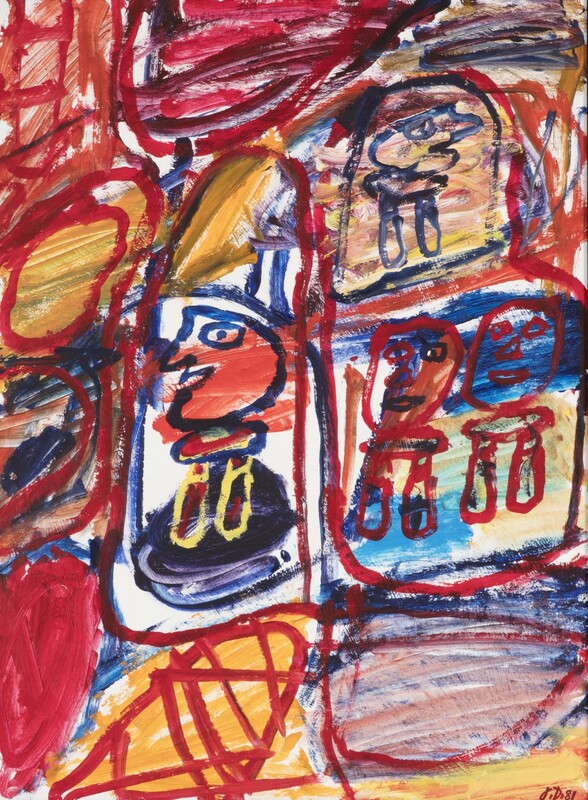 Here the simplified figures which emerge amongst the boldly coloured and childlike scribbles display Dubuffet’s belief that art brut offered “truer” modes of expression than classical art.